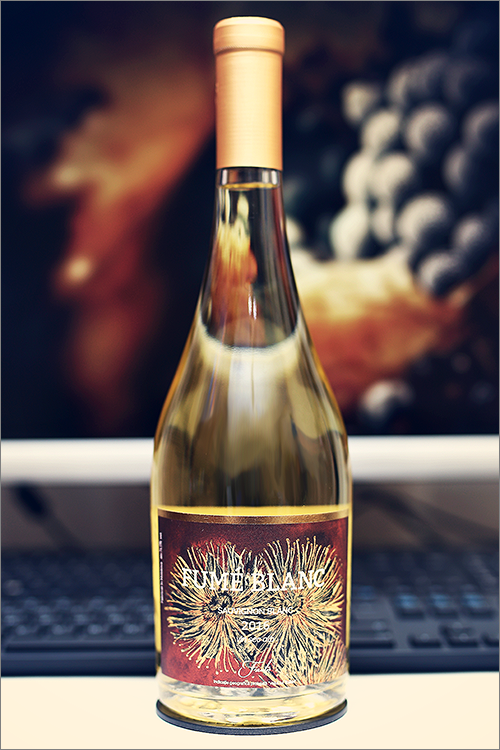 Tonight we are going to review a wine, that conquered our hearts from day one – Fumé Blanc 2016 from F’autor Winery. This is a 100% sauvignon blanc wine that impressed us with its expression of variety, as this is a barrel fermented sauvignon blanc wine. Oaked sauvignon blanc wines are quite rare to find, especially here in Moldova, that’s why this wine is so special. The name it bears is history: it was made-up by Robert Mondavi in an effort to increase the popularity of sauvignon blanc wines. He came up with the term ‘Fumé Blanc‘, which is a word-game that derives from the famous Pouilly-Fumé region in France and the name of the grape variety that made this region so famous all over the world. Without further ado, let’s get straight to the tasting! Pastel green color with topaz yellow shades towards the rim of the glass. The nose is strong, filled mostly with citrus and sweet fruits: lime, green melon, gooseberry, lemon, green pear, peach, white nectarine, mango, pineapple, green apple, elderflower, green apricot, lindenflower honey, quince jam, vanilla, fresh oakwood and some nuanced hints of banana. The wine is dry, with high alcohol level, high acidity and firm tannin. It feels oaky, expressive and elegant, with a nuanced citrusy-tropical accent. This is a quite crisp, smooth and velvety wine, with a nuanced woody profile and a bit sharp mouthfeel. It has a nice overall balance and a quite appealing minerality, as it feels creamy and complex, with a tannic-ripe mouthfeel towards the end. It has a medium-plus finish and a woody-velvety, maybe just a bit austere aftertaste. This is definitely a great Wine of Moldova and the overall rating says the same, with 91.2 points scored it is right there, among the best wines we’ve tasted so far. Please click on the chart icon on the left in order to get to the wine rating page, where you can find all the wines we’ve tasted to date. Conclusion: this is a fine sauvignon blanc wine, one that is very close to its top form, clearly on the rise, therefore we would recommend 2 or 3 more years of bottle ageing. What makes this wine truly unique, is that it made history, as this is the first ever Wine of Moldova to be awarded 90 points by Robert Parker’s Wine Advocate. Also, it has been awarded a silver medal by Decanter World Wine Awards, which is impressive. In order to explore this wine at its full potential, we recommend to pair it with creamy or fat-rich dishes, in order to enhance wine’s creaminess, like for example buttery linguine with black truffle or some pesto shrimp pasta, as those are fine pairings indeed. Enjoy!